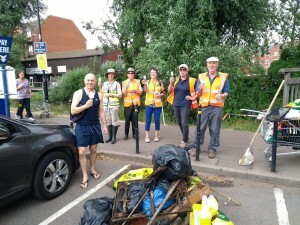 On July 26th, I joined the Market Harborough Environment Group for their monthly litter-pick of the River Welland as it flows through Market Harborough town. Compared to last year, we are seeing a large reduction in the amount of waste and rubbish being pulled from the river each month. It appears as though the litter picking efforts are really making a difference!